One week. That's all Jessie said. A one-week break to get some perspective before graduation, before she and her boyfriend, Chris, would have to make all the big, scary decisions about their future--decisions they had been fighting about for weeks. Then, Chris vanishes. The police think he's run away, but Jessie doesn't believe it. Chris is popular and good-looking, about to head off to college on a full-ride baseball scholarship. And he disappeared while going for a run along the river--the same place where some boys from the rival high school beat him up just three weeks ago. Chris is one of the only black kids in a depressed paper mill town, and Jessie is terrified of what might have happened. As the police are spurred to reluctant action, Jessie speaks up about the harassment Chris kept quiet about and the danger he could be in. But there are people in Jessie's town who don't like the story she tells, who are infuriated by the idea that a boy like Chris would be a target of violence. They smear Chris’s character and Jessie begins receiving frightening threats. Every Friday since they started dating, Chris has written Jessie a love letter. Now Jessie is writing Chris a letter of her own to tell him everything that’s happening while he’s gone. As Jessie searches for answers, she must face her fears, her guilt, and a past more complicated than she would like to admit. Have you ever read a synopsis of a book and just immediately think of another book that you had read in the past, who hasn't. However, this was not the case. I immediately thought of a movie. And although it is based off a book, I have only ever seen the movie and not read the book. Please save the judgement for later. But this movie is Gone Girl. As I readied myself and being, like everyone else, with Chapter 1 I soon began to realize that this book was going to be so much more than what I had presumed. This a book that tackles a teenager's life who is currently dealing with cope with loss, care for their parents, while also navigating with a vicious environment. I think what hooked me into the story was the amount of emotions that were happening throughout the entire story. The text was fantastic as it painted a picture that made me feel like I was on this journey that soon became a journey of understanding. However, it was more than just understanding Chris's disappearance but also the atmosphere of the town's view point. Overall, This is Not a Love Letter, is a beautiful written heart-wrenching tragedy that will leave your body numb for days. 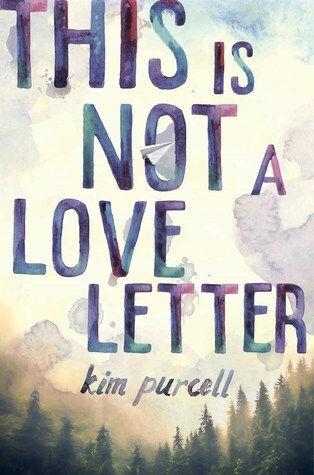 Written perfectly to mirror a teenager in today's world struggles Kim Purcell excels in writing a story that will leave a lasting impression.